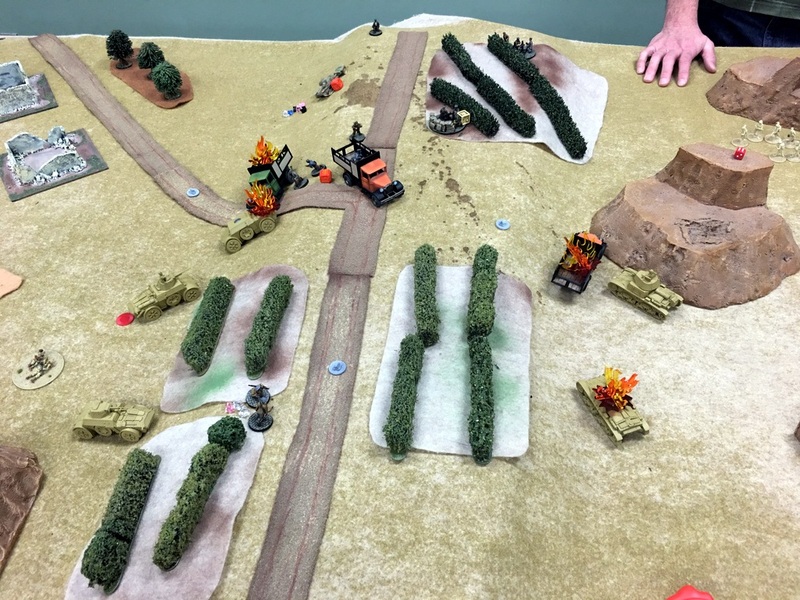 I played a pre-league game last night with my French Resistance vs. Chris H’s Italians. Although we had a good time, I don’t think it was satisfying for either of us. We checked against the Operation Torch theater rules and, with the layout of the table, selected Hold Until Relieved, with the crossroads piece as the objective. Here’s the thing: he (almost certainly) could not win. With 3 units and maybe 14 models that could claim or contest the objective (vs my 8 units and 40 models). What’s the point of playing if you can’t win? Similarly: although the game was effectively a lock for me, I had next to no agency in it. Those cars and tanks might be lightly armored, but that’s still enough to reduce my options for dealing with the vast bulk of his force to next to nothing (2 panzerfausts, a bazooka, a flame tank, and a mortar), none of which are Great (panzerfausts being 1 shot and Mortars being criminally unreliable leave me with hoping I get lucky on activations and maybe get to roll well with the bazooka and flame tank). What’s the point of playing if you can’t do anything? Like I said: it was a good time, but was unsatisfying. Chris asserted that the difficulty he would face in winning the game was a balance to my difficulty in stopping him. He’s not wrong: it’s a balance, but it’s a rotten one, and dependent on the scenario. If we’d played a scenario out of Tank War, the tank platoon wouldn’t have the same challenges, but the infantry platoon’s lack of agency would still be present. More importantly, though: it’s Harrison Bergeron-style balancing. “Both of you are screwed; thus It is balanced” isn’t fun. I’m not sure what the fix is. I simply believe Tank and non-Tank platoons should not mix, but a lot of the guys at the store have a lot of tanks and they want to play with their tanks, and I respect that. The leagues at the store are always going to permit Tank platoons, so refusing to play against other Tank platoons isn’t going to work (and would send the wrong message). I suppose I could play a Tank platoon myself, but I don’t want to do that right now. Anyway, I’m mostly thinking out loud here. 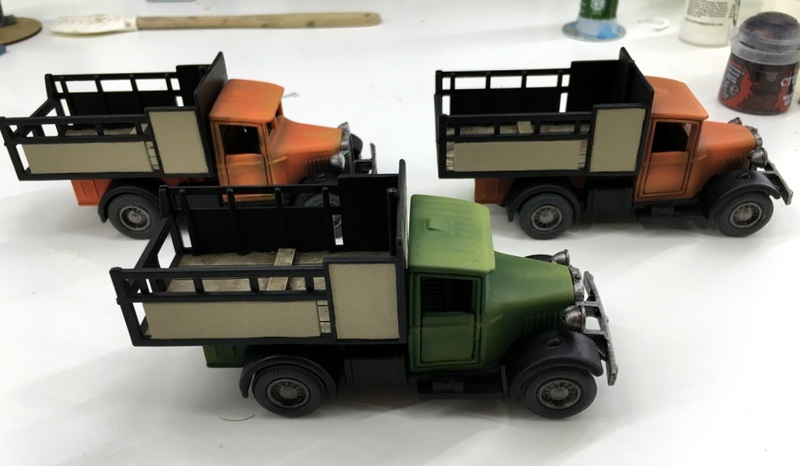 Related/unrelated – I did have a lot of fun playing really aggressively and tactically with my trucks. Instead of just using them to rush up a bunch of grizzled partisans (and inevitably getting them blown up while doing so), I scooted them around, blocking approaches and providing cover. In the picture above, the truck really locked down that M14/41 from getting where it wanted to be for half the game. This entry was posted in Warpstone Pile on 2016-03-25 by Rushputin. 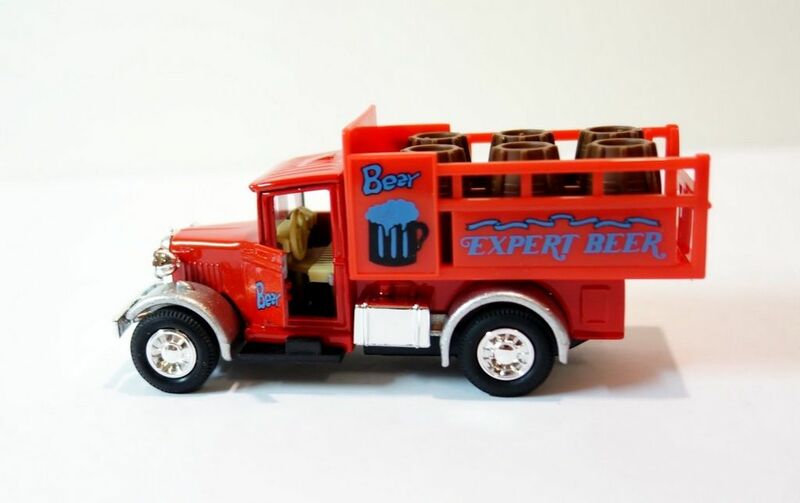 Last summer, when I started putting together this Partisan list, I picked up a bunch of Ledo/Welly trucks. There are better, resin options, but they all run 3-4 times as expensive as just using what’s effectively an upscaled Matchbox car. I finally got around to painting them this weekend. They’re not great, but they’re okay. Better than unpainted. Practice is practice. I’ve got a few more that are smaller (took me a couple of tries to figure out which scale worked better), so I might practice some more on them. Definitely had some lessons learned in terms of applying the paint. Will definitely want to disassemble them and paint them in pieces next time. Finally, the automotive primer I like to use didn’t like the tires, which as far as I can tell are actual rubber. I had to gesso over them to get paint to stick. 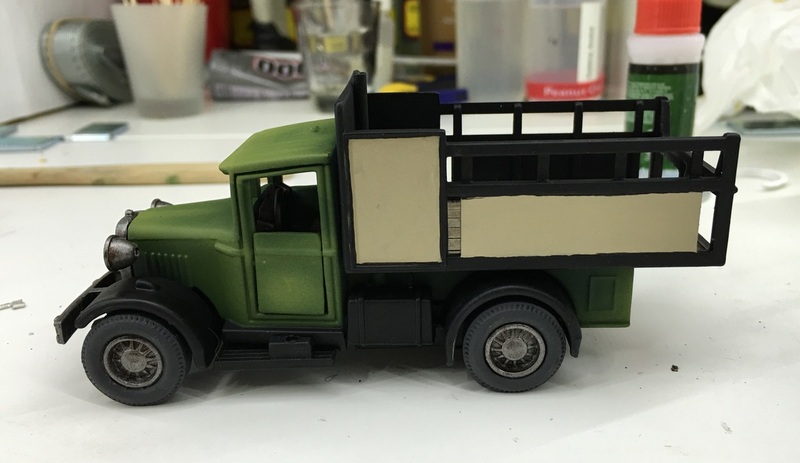 I still have to figure out something clever to put on the side panels, then they’ll get a final lick of Dulcote, and I’ll put the windshields back in. I really ought to weather them, if only to cover up the airbrush mistakes. 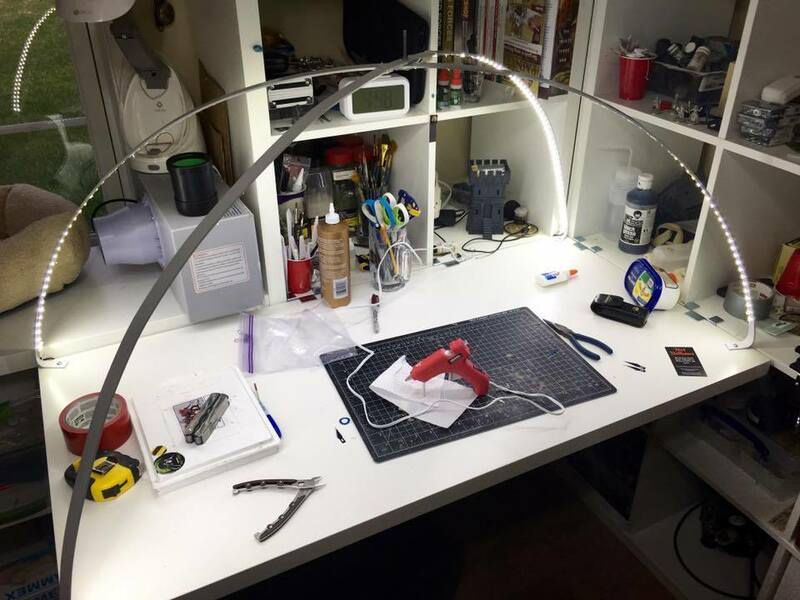 Finally got around to assembling my light arch last weekend. A light arch tutorial (Part 1, Part 2) made the rounds around DAHGS a month or so ago, and a couple of the guys followed it with success. I’d just had one of my LED lamp die (the light wouldn’t come on and I’d smell burning), so following the crowd was pretty easily justified. I am incredibly satisfied with it. The photos really don’t do it justice at all. It’s amazing. 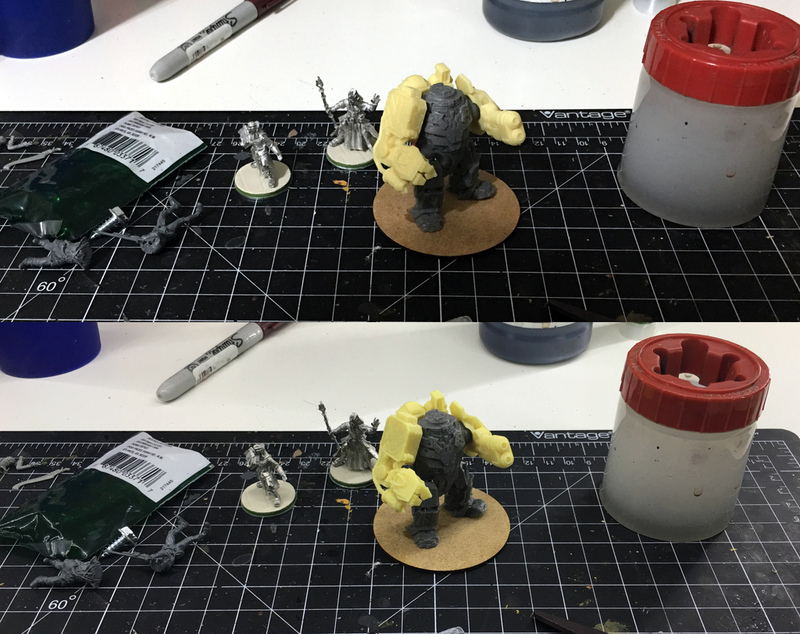 Good lighting is key to a successful paintjob, and I suspect that the light arch will be almost as big of a hobby milestone for me as moving to a wet palette. I followed the linked tutorial pretty closely, with a couple of deviations. 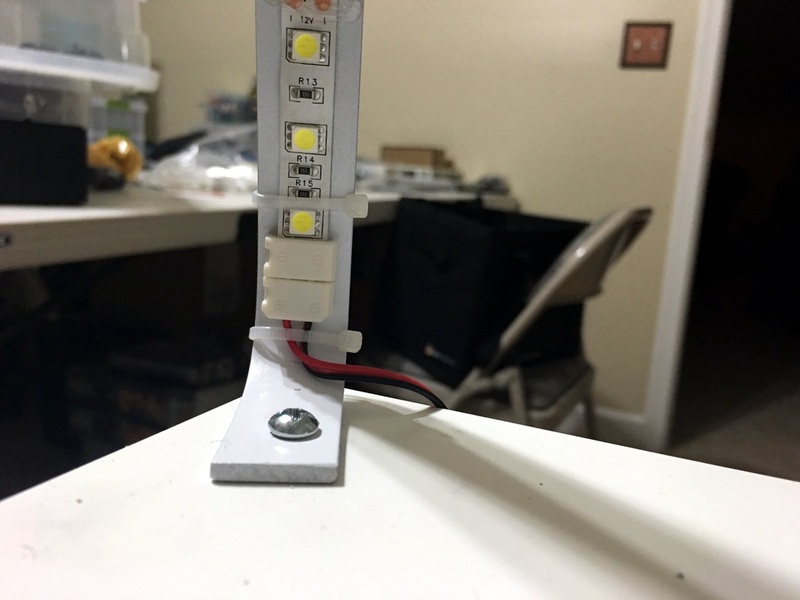 I also ended up with a bunch of T, L, and X connectors that simply didn’t get used in the build, but I’m sure they’ll be put to use later this year: now that Mrs. Rushputin has seen me do stuff with LEDs, she’s threatening to make me do the Christmas lights this year. What’s nuts is I could have gone brighter and done the 5630 LEDs. I didn’t, because I was concerned about length and needing to double up on power adapters. In the end, I think I could have made it work, but really: not complaining. Anyway: the tutorial talks about termination bars: that’s not a thing that gets used here in Virginia. Fortunately, Brett found these 8′ long aluminum bars at Lowes (but not Home Depot) that are thick enough to be sturdy but thin enough to be simply hand-shaped. I could have gotten them in 6′ lengths and probably would have been OK, but when I lined everything up I think they turned out more like ~6’8″, so the extra couple of bucks and a minute with a hacksaw turned out to be worth it. Honestly, the hardest part of the entire build was bending the feet. I’m sure there’s an easier way to do it, but I just used pliers and brute force. If you can figure out a more effective way of doing that, I’d recommend it. After getting the arches together, I sprayed them with white enamel paint. I should have give that paint longer to dry than I did; there are a few spots where it’s crackled, thanks to a second coat applied either too late or too early. 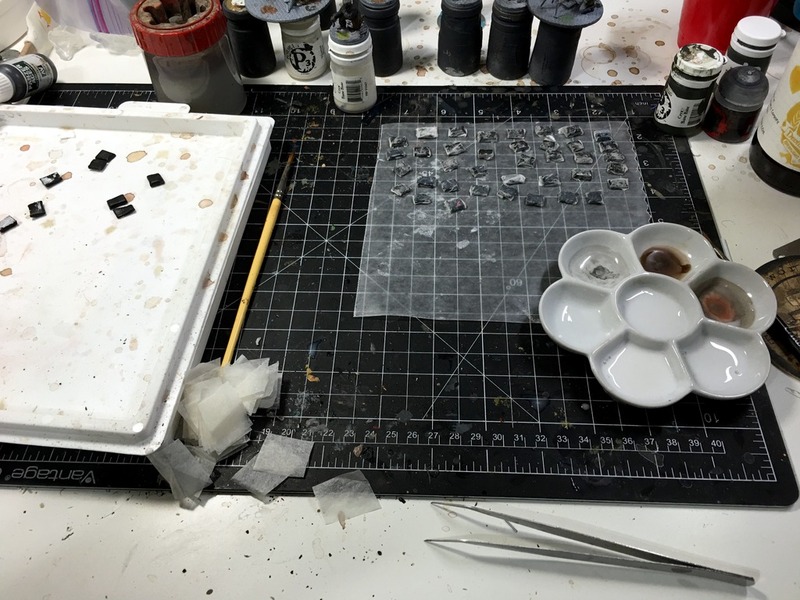 Then, I bolted them to my desk; I have a dedicated paint station, so I can do that. 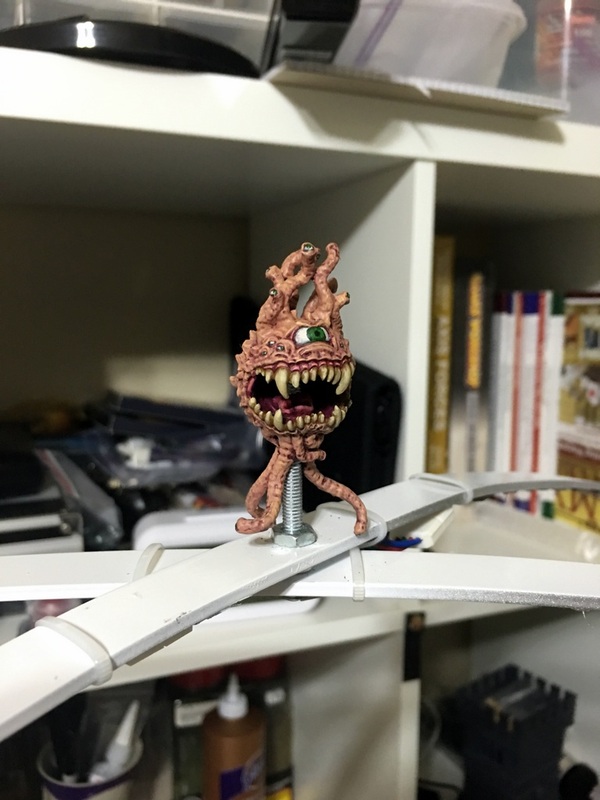 Other folks have bolted it to pieces of wood, or you could just have it sit on your workspace. 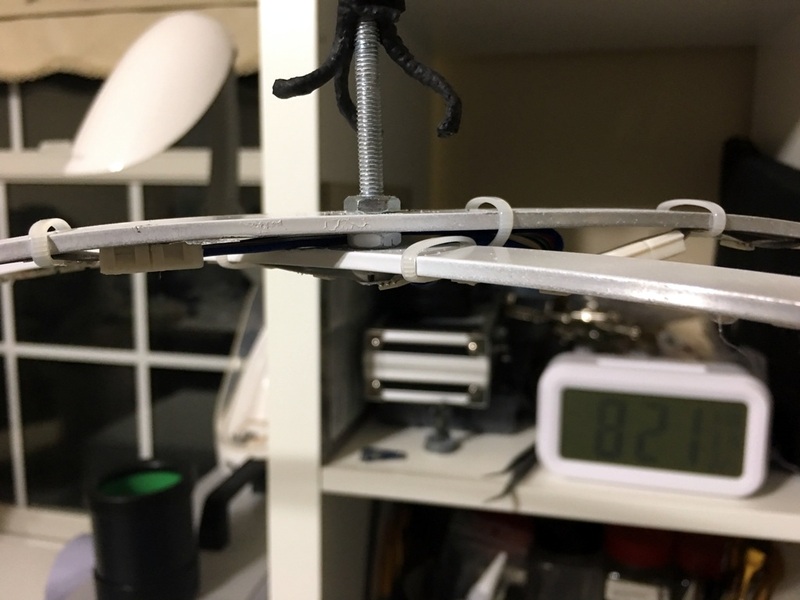 I used a connector wire to bridge the top bar at the intersection. This would have been easier with a shorter cable, I suspect, but it worked out okay. 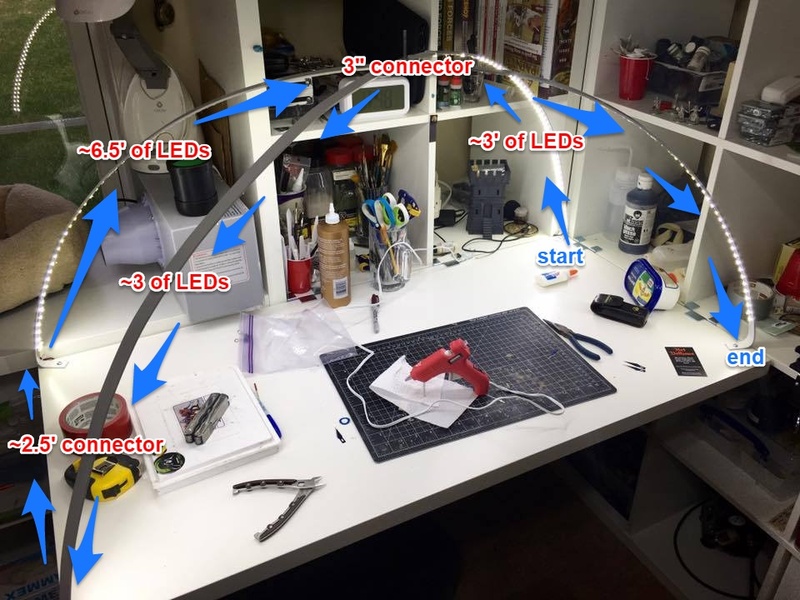 Instead of just running LED along the edge, I used the 3′ connector wire to bridge the one arch to the other, and hid the cable with the cable concealer. 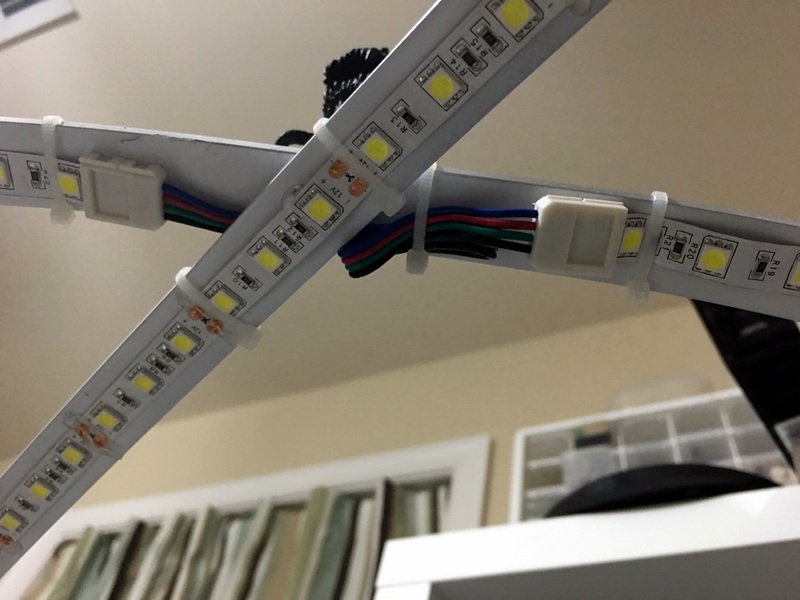 The LED strips are self-adhesive, but he’s not kidding when he says it’s not great. So, at every point where I could cut the strip (every 3 lights or so), I hot glue gun’d across the arch to hold it in place. I also reinforced every point where there might be some extra pull with zip ties. The remote is key. The tutorial might claim it’s optional (but Highly Recommended). It’s not. Spend the $5 on it, or plan to fish around behind your desk to plug and unplug stuff when you want to turn the light off. 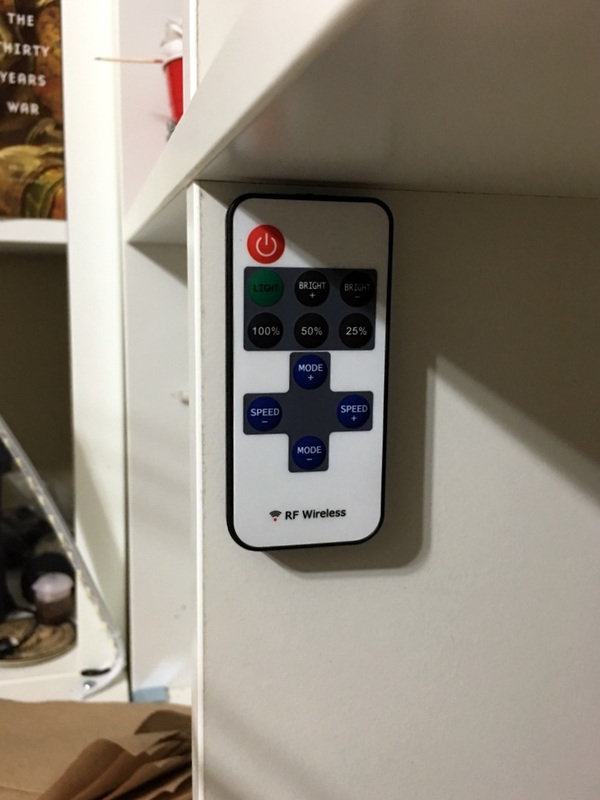 The remote is little, though, so I mounted it to the side of a shelf with some velcro. It’s not going anywhere (but, like, if it had to it could). Mounting stupid crap to the top of the arch. I’m not saying I’m going to decorate it seasonally or anything… but I’m also not saying I’m not, if you know what I mean. This was unbelievably easy to build, and the result is far more effective than I’d expected. If this is something you think you can use (and if you do work that requires good lighting), DO IT. 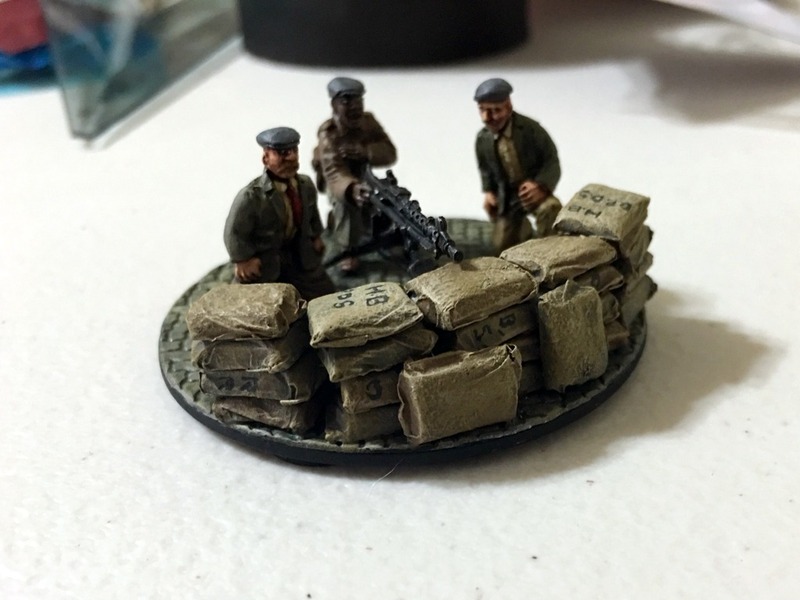 This entry was posted in Warpstone Pile and tagged Allegedly Helpful, hobby on 2016-03-18 by Rushputin. I’ll be running Amiens again at Madicon this weekend (Saturday morning, 9AM! Be there, or be somewhere else! ), so I really need to get around to posting the dang updated lessons-learned rules (“Post BA WWI rules” has been in my to-do list all February). Then, I’ll just stick the PDF in a link on the side and that should be the last you hear of it for a while. Basic move rate for infantry units is reduced to 4”. Running infantry units is 8”. Vehicle movement is also reduced: 6” for tracked and half-tracked vehicles, 9” for wheeled vehicles. This worked out about perfect. Carrying over weapon ranges feels just right, but 6″ movement felt all kinds of wrong at this scale. Stepping it down worked great. Obstacle. Does not block line of sight or provide cover. If an infantry unit Advances over it, roll a d6 – on a 1-2, the unit is Entangled: it must stop movement before crossing the barbed wire and takes a hit. An Entangled unit may not benefit from a Down order. A section is removed when a tracked vehicle moves over it, or when a unit with the Pioneer rule and two or more models in contact with it at the start of their activation is given a Run order; this consumes all of the movement of those models. A tracked vehicle may only remove one section at a time (ie: it cannot drive over two adjacent sections) but may remove more than one section in a single movement (ie: drive over one line of barbed wire and continue on to drive over a second, third, etc). This worked out fine. I don’t think it came up all that often, but barbed wire was an effective deterrent: the Germans used it in an attempt to control the flow of the British as much as they could. So: as expected. This is a line across the width of the table. In the first turn, it activates first and advances from the British edge of the table. In subsequent turns, it gets its own Activation die. 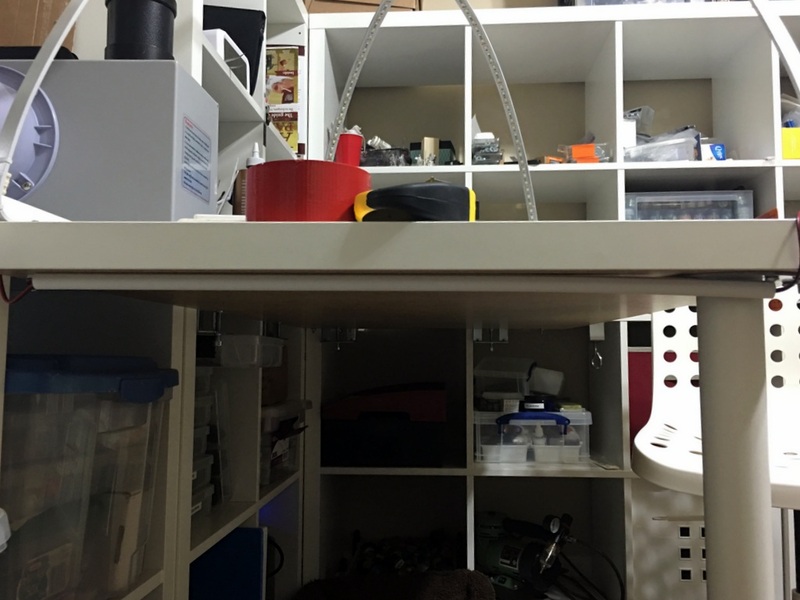 When it is activated, it will advance 2d6+6″ towards the German table edge. Shooting across it provides heavy cover. 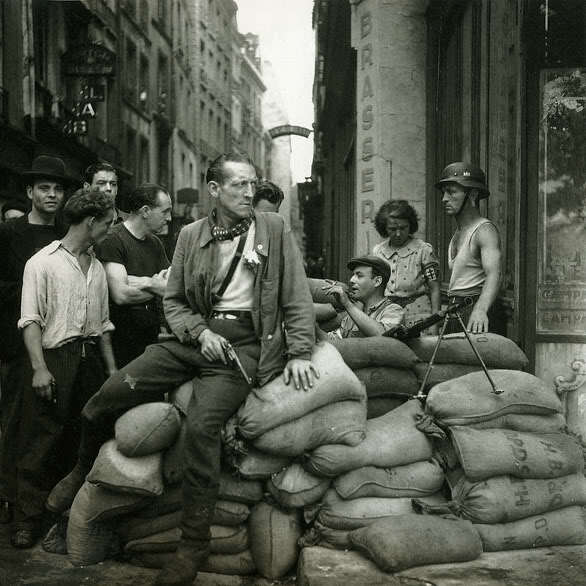 Exposed units may not be given a Rally order when Caught in the Bombardment. After advancing the Creeping Bombardment, roll a die for any Barbed Wire sections now within 6″ of this line. On a 6+, remove it. I had to throttle back on this table, big time. In my first playtest, even being Entrenched didn’t help much. 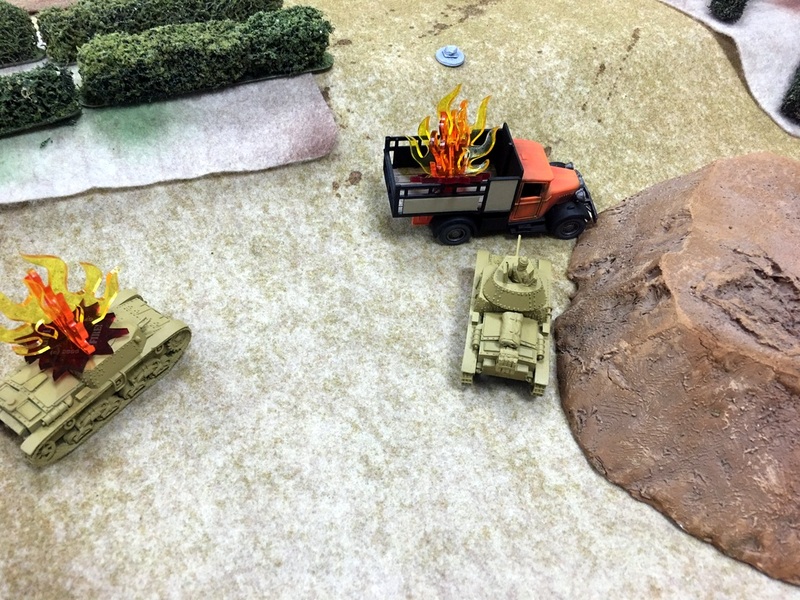 Although this represents a bigger deviation from basing the table on being hit by a Heavy Howitzer, I think it worked better. Up to 20 models may shelter in each bunker. Units in a bunker are never Caught in the Bombardment (but might be treated as such if they exit the bunker into the bombardment). Otherwise, bunkers are treated as buildings. This didn’t come up in the game: nobody hid in the bunkers. A unit wearing gas masks may not be given Advance or Run orders. A vehicle may not be given a Fire, Advance, or Run order. A model wearing gas masks is at a -1 penalty to hit with shooting and always fight last in Close Combat. This didn’t come up in the game: gas wasn’t used at Amiens. I’d like to give them a try at some point. The model is wearing a gas mask: The model is killed on a 6. Veterans may reroll failures. The model is wearing a gas mask: The model is killed on a 2+. If a vehicle is ‘killed’ by this roll, treat it as a Knocked Out result. Units may not be deployed in an Outflanking maneuver. However, units brought on from Reserves may be brought in along the edge of the table at the trenches, with an additional -1 penalty for the trenches nearest their side of the table, and a -2 for the trenches furthest. This is decided when making the order check. So: a unit may be brought in from Reserve along the table edge at -1 morale, the near trench at -2, and the far trench at -3. Originally, sides could bring in reserves from trenches that they “controlled” (so, once the British crossed Trench 1, the Germans could no longer bring in reserves from that trench and the British could). This update adds flexibility and risk-reward. I think it’ll work out. Units may not Run across trenches. Trenches provide Heavy Cover as if it were a building. When a unit is hit by an HE round in a trench, roll a d6 – on a 1-4, the Extra Protection rule is not ignored (on a 5-6, it is ignored as usual). To clarify: when a unit is hit by an HE round in a trench, on a 5-6, they require 6s to be wounded. Units may fire at other units down the length of a Trench using true line of sight, but any model more than 6” away is always out of range. At the beginning of the game, determine if trenches are wide. If trenches are wide, vehicles may not cross them except across a fascine. These worked out as expected. The scope of this conflict ranges for miles and miles and miles along the line along the front. When an Order Die is removed from the bag (because a unit is eliminated) it may be recycled. To recycle an Order Die, select a dead, non-vehicle unit from casualties (or assemble an infantry squad from casualties): non-vehicle, non-team units recycle on a 3+, vehicles and units with the Team rule recycle on a 5+. If you succeed, the unit is placed into Reserves at the beginning of the next turn. If you fail, the Order Die is removed from the game. You do not have to immediately recycle the Order Die. This was the big lessons-learned from the game: by allowing the players (especially the Germans) to infinitely recycle their units, effectively removing any consequences from losing a unit. “I’ll run the flammenwerfer forward: if it dies, that’s okay! It’ll be back next turn!” This will help keep things from being hopeless but will make using a unit, especially a Team, still hurt. The Mark V* tank had space to transport infantry; this was not done in practice because the conditions were awful. On disembarking from a Mark V*, its passengers immediately take d3 pins and must test before being able to complete their Order. Mark V*s were lengthened to handle wider trenches; as such they never require fascines to cross trenches. The British declined to use these as transports, and the trenches weren’t wide so neither of these came up. After June 1917, German machine guns get +1 Penetration against tanks. This was, I think, key to the Germans not just being miserable all game. It gave them capability to deal with the British tanks. German NCOs may not be removed with exceptional damage. I don’t remember if it came up or not. Exceptional damage is an important rule, but could slow things down in a larger game so I’m tempted to remove it entirely. 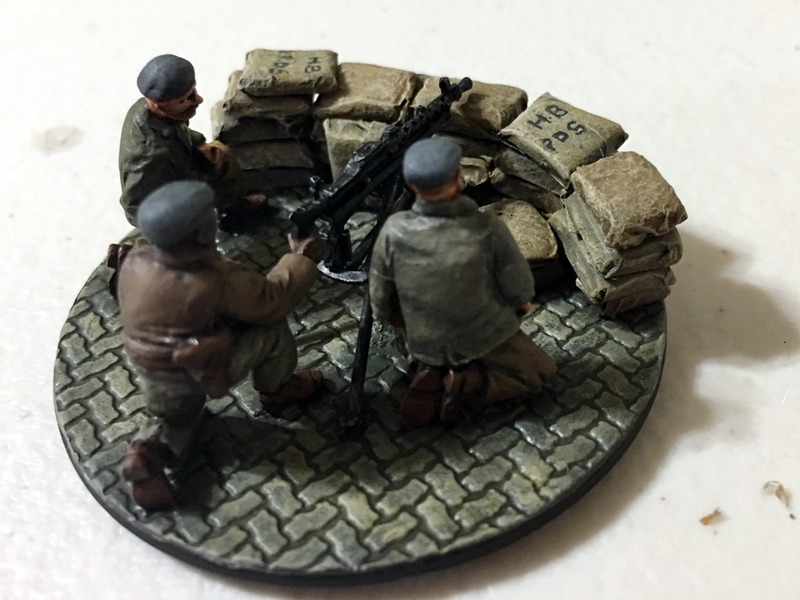 This entry was posted in Warpstone Pile and tagged Bolt Action, WWI on 2016-03-07 by Rushputin. 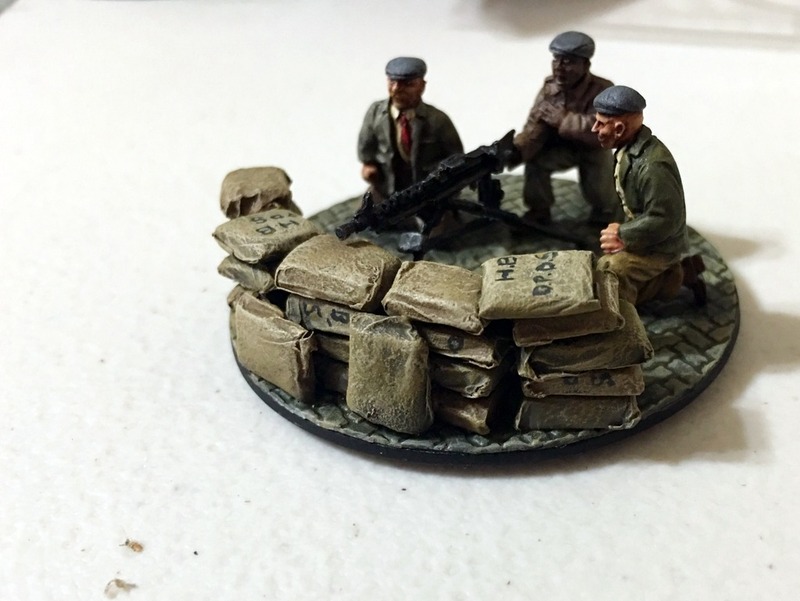 I decided to solve the problem with sandbags. I’d remembered John saying something about making sandbags with teabags (and that’s about all I remembered). 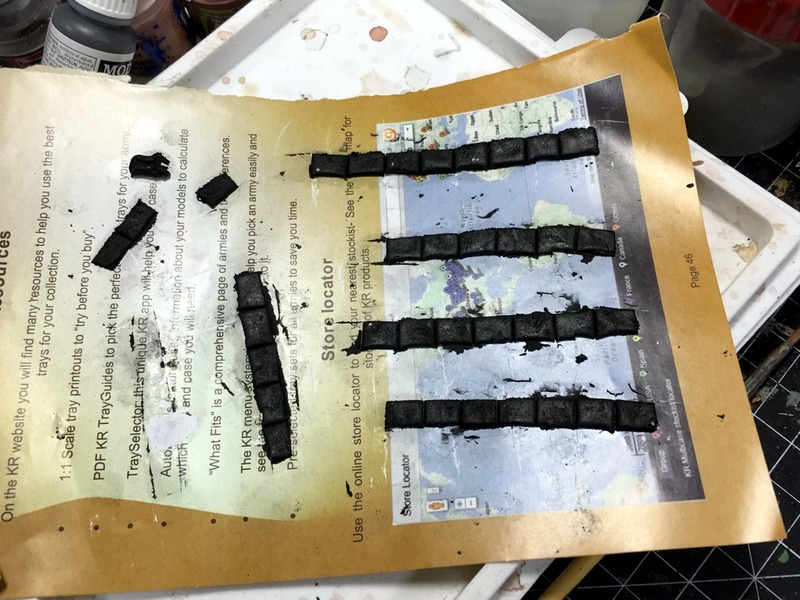 So: I sculpted some chiclets out of apoxie sculpt (I used black here because I had some and I hate it: never buy black apoxie sculpt unless you want black fingertips). Then, I snipped emptied out some teabags and chopped them out into squares. A quick soak in some watered-down glue, then folded it around the block. I’d expected the teabag to provide texture, and it does, a little, but really where it’s really been useful is in how it behaves like cloth. Folds, wrinkles: that sort of thing. 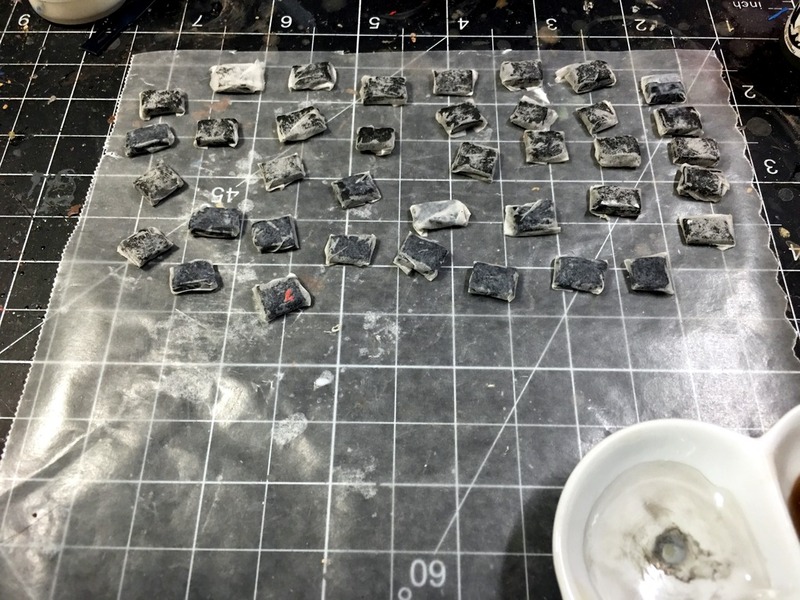 After everything dried, I superglued them together while placing them on the model, then brushed over the teabags with it as well. They’re not perfect, but for a first attempt I’m pleased. Where it falls short is the chiclets: they’re inconsistently thick, and a little too brick-y. Next time, I’ll try to get them more consistent, and with rounder, baggier shapes. I think that’ll be the key If I can time right, I’d try to catch the chiclets mid-cure: firm enough to be manipulated but soft enough to be shaped so they sit like bags. Might even try doing the teabag-mache with them at that stage; I think that can only help make them look like they have weight to them. 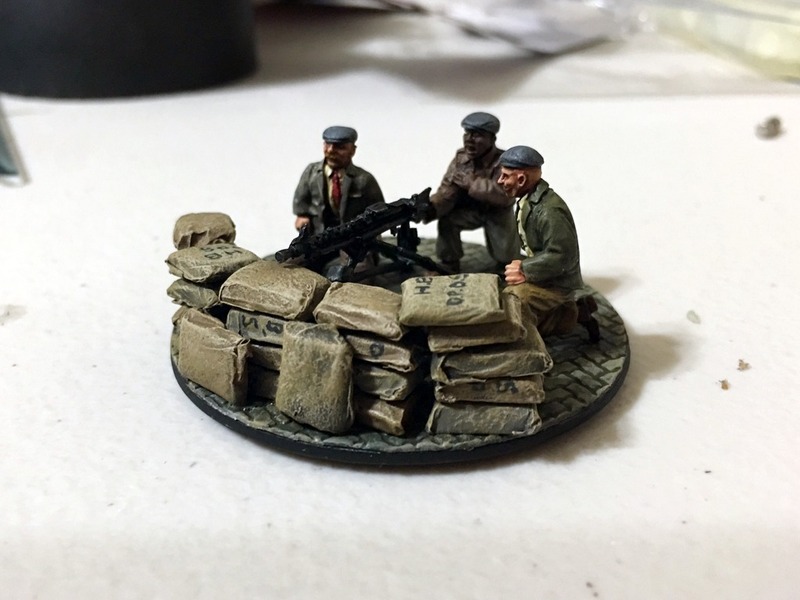 This entry was posted in Warpstone Pile and tagged hobby on 2016-03-07 by Rushputin.